72% of the companies will increase their IoT spending in the next three years. 60% of the companies are already involved in IoT initiatives. More than half of these, however, are still in the early stages of deployment and have some ongoing IoT projects. Cost reduction is seen as the biggest driver of moving IoT initiatives forward for 69% of the companies. Investment decisions for IoT solutions are mostly made within IT departments but line-of-business executives also have considerable influence. Companies cannot bear the fruit of the IoT on their own, and will require assistance along the way. Aside from the above insights, of the many manufacturers that are in pursuit of digitization, a large number of these projects are unlikely to succeed according to a 2017 Cisco study finding 74% of companies that begin an IoT initiative fail. More often than not, projects go over budget, deployment times run long, interoperability issues occur across legacy platforms, or planning and resources aren’t allocated appropriately, leading to their cancellation. This failure rate has led to manufacturers’ hesitation about embarking on digital journeys. Transformation requires buy-in at all levels, from the front office and on the shop floor, but it also requires internal leadership. It’s critical for manufacturers to recognize the important role organizational attributes play in long-term project success. Where do we stand now? Does your team have the right people in place to implement new technology? Are there project leaders capable of owning this project? It is vital to build trust among everyone involved in the manufacturing process so problems can be quickly identified, and new solutions can be effectively implemented as a team. Don’t let a lack of communication stand in the way of change. Does your team have an environment capable of communication and applying process changes not just from the top down but from the bottom up? Before you embark on our digital transformation journey, it's important to get as lean as possible with your current capabilities. However, setting the stage for a lean process is just the first step; implementing a system that enables you to maximize your manufacturing productivity results will take your lean model to the next level. Ask yourself: Are we lean? Do we know what our top areas of waste are? Have we embraced lean-manufacturing principles? Depending on the systems and processes you have in place on your factory floor, having specific KPI’s will enable you to assess, analyze and track manufacturing processes, while evaluating success in relation to goals and objectives. Ask yourself: What are the key performance indicators that we want to measure as a benchmark for our improvement? Do we have any information now that we can use for this benchmarking? What tools do we want to use to measure our efforts? Having the right tools to measure your efforts—for designers, managers, workers, consumers, and physical industrial assets—will unlock enormous value and change the manufacturing landscape. What tools are in your toolbox right now? What tools do you need to measure success? What tools do you need to upgrade? The connectivity of data will enable you to deliver competitive advantages in an ever-competitive landscape. Networking your machines and ensuring that all production data can be captured is one of the essential capabilities for real-time analytics. Ask yourself: Are you ready to digitize our assets? Do you have the technical assets in place to capture and store the data? If you focus on your entire plant, you will make success much less likely. Try starting with a small project in a key focus area. Determine what you are trying to achieve, then measure it before and after any IoT project. The days when operations could implement network-related projects without IT are gone, or at least close to extinction. Success is much more likely achieved by working closely together. Make sure you fully understand the different networks in use all the way down to the data you want to capture for analysis. Keep your data set manageable and use basic statistical analysis to look for outlier data. You need new technology to achieve the promise of many IoT benefits, and you need the expertise of people, vendors, and partners to get there. Remember, digital transformation doesn't happen overnight. It's a journey. Getting from today’s practices to tomorrow’s successes cannot be done in one giant leap; it is an evolutionary process. Readying your team's capabilities and learning from the mistakes of others will best prepare your team for a successful implementation. Graham Immerman is director of marketing with MachineMetrics. 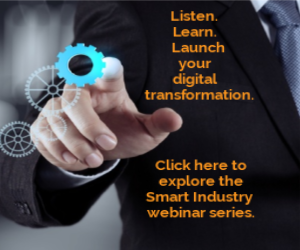 Learn from the mistakes and successes of pioneers of digital transformations at the 2018 Smart Industry Conference. Click here to learn more.